If you are anything like the majority of Americans, you might be tempted to run out and buy items each day that you probably do not need. It doesn’t have to be much really, either. It could be a huge extra-large drink at the QuikTrip, or a bag of chips from the vending machine. It could be the dollar spot at Target, or a few little things on Amazon. Or, it could be a grande mocha at Starbucks on the way into work, or a Redbox DVD rental. It happens all too often to far too many people. And it’s the result of a lack of self control. Many people have opted to make what seems like the better choice in any or all of their situations without taking consideration for the long term consequences. I’ll admit, it’s incredibly hard to break out of your routine and make a decision that’s more realistic. It’s incredibly challenging to say no to the little pleasures in life that make you super happy. In some cases, it’s hard to be that one person who seems like a party pooper for not wanting to spend, knowing that you have a long term goal in mind. If you are reading this or you found this article, you may lack some self control. The reason why you are not making any advancement to fund your emergency fund is obvious. You want to start a college fund for your kids, but you can’t seem to make it work. Even worse, you might even have to pick up another job because you can’t pin point where all the money is going from your first. You don’t have a clue where all the money is going. You have no idea what you are doing wrong. Not only has your spending spun out of control, your behavioral habits have taken a wild ride too – you feel the constant need to satisfy the urge to spend, but you know that you aren’t really making progress in your life and you have lost touch with the reality of your behavioral issues behind your spending as a whole. So what are you to do? 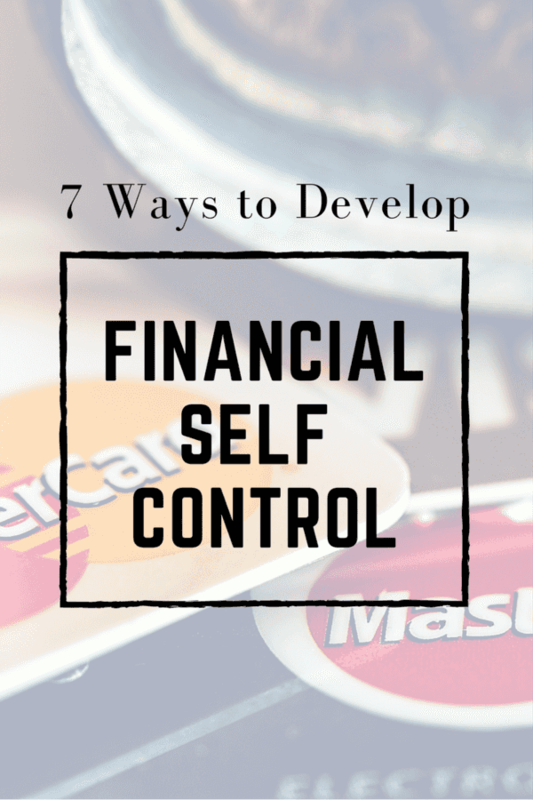 Here are a few different ways to develop your self control, so you can learn how to move in a solid direction that benefits your financial goals. Every time you buy something you are delaying your financial goal. And in many cases, if you justify your expense, you are creating an excuse as to why you can’t reach that financial goal you have identified. Delaying your goal has allowed you to have instant gratification – what feels good to you at the moment. Self control requires you to ask yourself what’s more important – living in the present moment, or having a secure financial future because you decided to make the better choice. It’s obvious that a long term goal requires delaying gratification and finding contentment with the things you have instead of turning to the next best item for the sake of temporarily fulfillment. Look at every single purchase you plan on making and determine if it’s really something that you need. Is it a life or death necessity? Or are you purchasing it just to make yourself feel better? Perhaps you can find a less costly option? Do you have to put it on credit? Or can you pay in cash? If you have to finance or put it on credit to be able to purchase it, that should be a sign that perhaps it’s not truly something that you absolutely really need. Self control can be a challenge, I agree – sometimes you have to be able to say no to the things you so desperately want in order to reach your goals. Self control allows you to be able to know when it’s ok to say yes to some things, but also recognizing when you need to say no – and being able to accept that as much as you want certain items, it’s going to negatively impact your long term goals. Credit cards are such a big business today because we live in a time when most Americans don’t want to wait – they want items now. People live in the now – if they didn’t, Amazon would not have had any need to develop Prime Now, they would have let Americans wait for the regular Prime shipping. Companies advertise credit cards heavily because it helps people fulfill their desire for more stuff and distracts them from the reality of the cost of their spending. When you are easily distracted you continue to spend. Since cash never leaves your hand, you don’t have the tie of emotion and pain associated with your purchase, and provided the credit card swipes without an issue, you delay the reality of your spending to satisfy your immediate need. Instead of using credit, go with cash only. If you lack financial self control, instead of avoiding temptation by shopping altogether, take a more sensible approach to helping re-develop your self control and put your temptation to the test. Instead of avoiding shopping opportunities entirely, leave the credit and debit cards at home and carry cash you can afford to spend. Put a limit on what you are able to spend there – in fact, if you aren’t shopping for a specific item, then avoid taking cash at all. The point of doing this is to teach you how to resist the temptation to spend. Over time, that will help you increase your self control. Many times you may hear that shopping is cheaper than a psychiatrist. You may have also heard of the term “retail therapy” – I know I have seen it advertised as blog slogans in some cases. Eventually people realize that shopping is a way out of an emotional hole. Perhaps that emotional hole is loneliness, isolation, or boredom. Unfortuatnely shopping isn’t a great replacement for a true friendship. It definitely isn’t a cure-all for an emotional void. Being lonely, can make us seek out things to occupy those feelings we’re missing, and thus materialism evolves. Sometimes, boredom or isolation can make us feel anxious and look for ways to fill that void through immediate pleasure. Buying things fills that void – at least temporarily. We also look for social connections – groups in a sense, that help us to feel like we are less alone. Groups that help us feel valued. Groups that can help us feel like we are part of something bigger than ourselves. Connections that may make us feel less alone. So in the hunt for satisfaction and immediate pleasure, we turn to shopping because that is what makes us temporarily happy. Over time, we medicate ourselves through a vicious cycle that perpetuates itself over time. Many people operate on the notion that money equates to social acceptance. People love to feel like they are part of a group. The urge to feel accepted and to feel like they are keeping up with society is very strong. That desire to be accepted by others is capitalized upon in an industry who targets products geared to people’s desire to be adored and sought after by others. In their quest, industries will place popular, highly desirable people at the forefront of their marketing ploys to establish trust. These people, or brand ambassadors, will often times resonate with people and make strangers feel as if they are connected to their customer base, establishing a type of loyalty that is impermeable. Once the loyalty has been established, there is no ceiling. People want to be like this person – live like this person and that means having the items that this person has because it makes them feel valued. Look amazing with NEW items geared to make you smell incredible. Feel better with supplements and products geared to cure your nutritional deficiencies. Get healthier with NEW weight loss products, energy drinks and products that will help you appear slender. Raise healthy children with products geared to help them look their best – supplements, lotions, creams, body products and even toys that will help them be healthy and happy. Look better with NEW cosmetics that will allow you to hide your deficiencies and allow you to look fresher, younger and vibrant. The price to feel accepted is SO costly. The true question is this – are all these items needed to feel accepted? Valued? Does one need to spend huge amounts in order to truly be healthy? The answer is no. You shouldn’t have to overspend yourself just for the sheer company of social acceptance. Understanding the role of social media plays such a critical role in your habits. The easiest and most successful way to save is to automate your savings – walk into your bank or log in to your online account, and automate your savings and retirement contribution(s) to allow you to save with ease. Eventually, what you set up will become second nature, and you will no longer procrastinate saving or put off your financial goal for something on the back burner for something that might be filling only a temporary void. It’s overwhelming – I get it. It really is. When you have a mountain of debt, and you find yourself struggling to uncover ways to save just a basic emergency fund, but you can’t seem to make headway to a better place in your financial life, it can be depressing. Likewise, it can be easy to have a nonchalant mentality about it all and get caught up in the moment of sheer excitement – after all, spending is just so much easier. Not having to worry about finances is just easier too – I agree. Until you find yourself in a pickle.. then it forces you to re-evaluate your position. You might not know where your money is going but you are part of a fun group of friends and family that share your common excitement – spending money on things that make you feel incredible is invigorating! It’s fun – new, exciting, and in the end, you feel like your social network is immensely powerful and that itself makes you feel amazing. Being able to identify with all of these suggestions above is the first step in gaining self control. With increased self control comes less worry about your financial state. Over time, you will find yourself traveling down a better road with greater independence. You don’t have to spend oodles of money to make something a priority. Sometimes, having less can equate to having more. Social acceptance should never be defined on the amount you spend or the items you purchase. True happiness comes from experiences, not things. Saving for your emergency fund and retirement is not hard – it just requires a few modifications and a profound commitment to yourself.